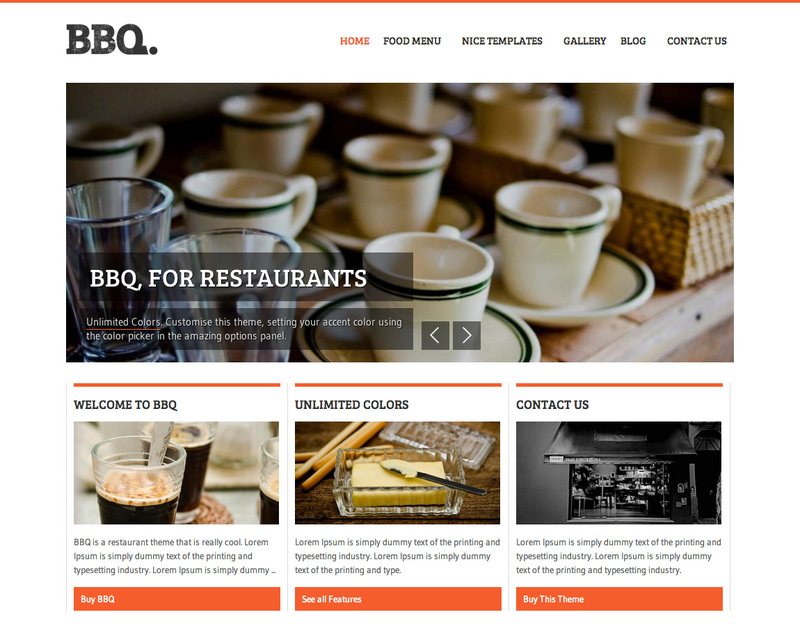 BBQ is the perfect WordPress theme for any cafe, pub, bar, restaurant or local business. With a unique and minimalistic look, you can easily customise it by uploading your logo and setting your accent color using the color picker in the amazing options panel. Pick an accent color to create the custom look you want without touching a line of code. Excellent system for administration of menu cards, with two different food menu layouts. Built-in widgets for advanced functionalities. Opening Hours, Twitter, Flickr, Tabs and more. Beautiful templates right out of the box. 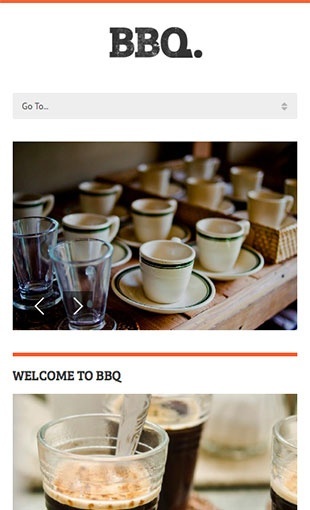 This theme comes packaged with different custom templates – Food Menus, Gallery, full width, contact and more. Brand your site in just the blink of an eye. Use the custom logo uploader within our Theme options and have your site look your own way. Effortlessly modify your site with our theme options panel. Nicely add your own logo, change the site style, add Google Analytics code and much more. Perfect for any Restaurant, Cafe, Pub or local business. Beautifully coded. Wether if you are a designer or a developer, you'll get to customize it your way. 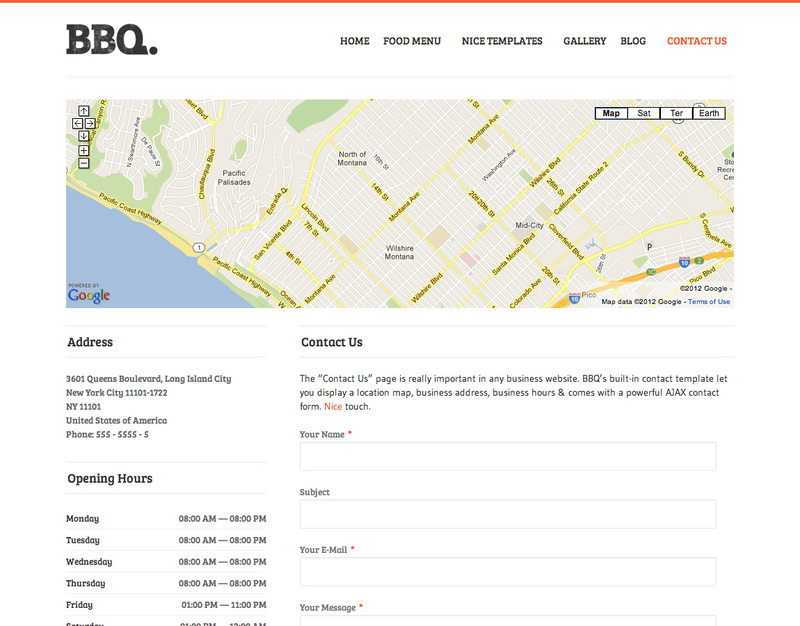 BBQ was crafted to provide an optimal viewing experience — easy reading and navigation with a minimum of resizing, panning, and scrolling — across a wide range of devices (from desktop computer monitors to mobile phones, tablets, etc). Anyone will see the beauty of your site anytime, anywhere, on any device. Nice touch. Our efforts go into making installation as easy as can be for you. Purchasing an NiceThemes product grants you a minimum of one year of free support from our friendly and experienced team.